Yes, one CD works for both waterfalls or rivers. Place speakers at the top and bottom of falls (and turn it up), or along swift waterways (and turn it down), the illusion of animation and flow is stunning. 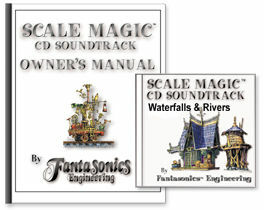 We've designed a number of scale waterfalls and rivers over the years, each has a slightly different flow and ambiance, but they flow together seamlessly in this CD. Its our greatest hits album. Play it quietly and encourage visitors to interact with the scene, this illusion works best 'close-up'. The background around these water features is an open forested valley, with wind and plenty of critters drawn to the water's edge... both day and night. This soundtrack is timeless.